Freight + Volume is pleased to present Daniel Ranalli’s latest body of work, Chalkboard Series. This is Ranalli’s first solo show with the Gallery. Chalkboard Series is a collection of 8 digitally montaged photographs of chalkboards that reflect on themes of mark-making and language, chance, and ephemerality. The images are taken from a diverse set of Boston University classrooms—philosophy, mathematics, engineering, and more—and mesh the oft-impenetrable, distinctive languages of art and science, texts and symbols. 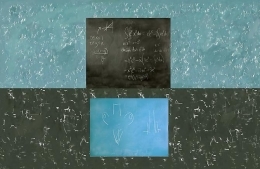 Initially inspired by the marks made on the chalkboard of a single philosophy class, Ranalli began to methodically photograph the chalkboards of various classes throughout the school, amassing a large inventory of chalkboard images over the course of four years. These “found” images recall Ranalli’s previous work, which often deals with the transitory quality of chance and mark-making: in the past, he has photographed sequences of snail drawings in wet sand, as well as sand dunes raked into large Zen gardens. Ranalli’s Chalkboard Series works are richly layered, both in form and content. 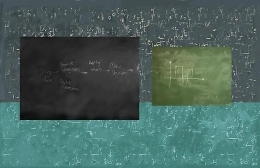 Partially-erased texts and marks are rendered incomprehensible and are used as background images to offset other chalkboard images that carry unique messages; the dappled effect of these partially-erased chalkboards often recall mysterious celestial bodies. 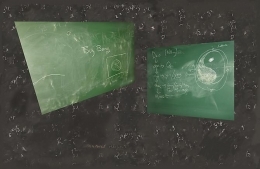 In works such as Big Bang – Yin Yang, for example, Ranalli not only plays up the cosmic quality of the montage by “suspending” two green chalkboards on a larger, black chalkboard flecked with leftover marks (“stars”), but also plays with the connection between astronomy and philosophy through the rhyme and alliteration of their subject matter. Ranalli has had over 130 solo and group shows over the past thirty years. His work is held in the permanent collections of over two dozen major museums, including the Museum of Modern Art (NY), the Boston Museum of Fine Arts, the San Francisco Museum of Modern Art, and the Smithsonian National Gallery. He has received a number of major artist fellowships including two from the National Endowment for the Arts, as well as the Massachusetts Cultural Council and Earthwatch. He continues to teach at Boston University. Nick Lawrence (Director/Owner), Kevin Kay (Managing Director) at 212-691-7700 or info@freightandvolume.com.